An introduction to how SolarWinds Orion and DPA work together to provide more visibility into performance bottlenecks using response time analysis. Performance may trend with health but it's not the same. Think of a car's speedometer and tachometer. If you want to know how fast your car is going, you look at the speedometer. While, if you want to know how hard the engine is working, you look at the tachometer. How hard the engine is working doesn't translate directly to how fast the car is going. The same is true with databases. How hard the server is working doesn't directly translate to how well it is performing. Database Performance Analyzer provides you the ability to quickly troubleshoot application performance by measuring the time that elapses from when an application issues a query until the database server responds with results. This response time analysis gives you a complete picture for diagnosing performance issues. 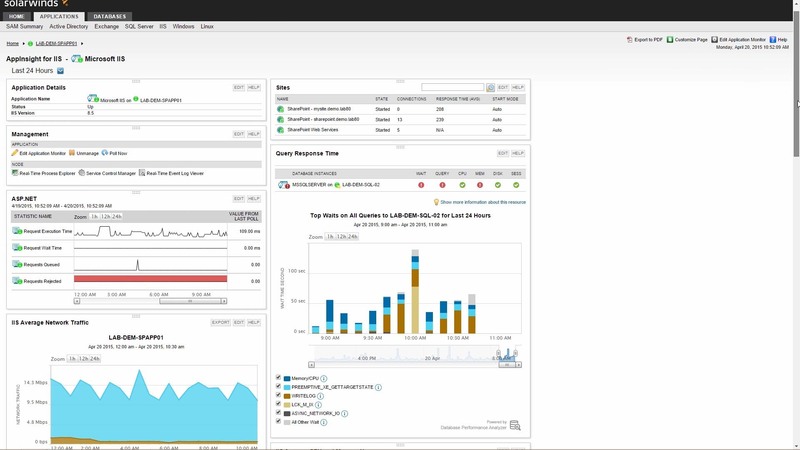 The Query Response Time resource displays wait times for queries from the application. In this example, AppInsight for IIS displays the total response time of web requests. When you integrate DPA with SAM, you can also see the database's contribution to the total response time. The bars represent the amount of time IIS waited on SQL Server during the last hour. The stacking bars break down response time into discrete wait types. Wait types identify the specific bottleneck within the database like CPU, memory, storage, and blocking. And now let's look at all queries to a database instance. The Database Response Time resource provides visibility of all queries to this database instance. This resource provides comprehensive multidimensional analysis for a database instance. In this example, the SQL tab shows you the queries with the most wait time. Here you can select which queries are displayed. Clicking the plus icon will allow you to see the entire SQL query. Clicking on a query opens a report in DPA that includes detailed analysis of historical performance including wait types, executions, reads/writes, and typical day. The Waits tab shows you the most significant wait types, which often reveals resource contention. You don't have to be an expert on wait types. Just click the informational icon for a detailed description of the wait type, common solutions and who is best suited to resolve the issue. The Applications tab reveals the application experiencing the most wait during this one hour period. This is helpful when your database instance supports several applications such as Peoplesoft®, Sharepoint® and Apache®. In addition, you can see top databases, nodes and users that are experiencing the most wait time.